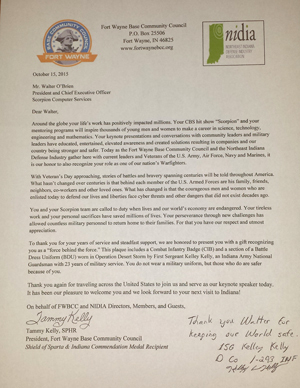 LOS ANGELES, CA - 12/07/2015 - Walter O'Brien, technologist, cybersecurity expert, and the CEO and founder of Scorpion Computer Services, Inc., was recognized by the Fort Wayne Base Community Council and the Northeast Indiana Defense Industry Association (NIDIA) for his, and his company's contributions to the United States military. 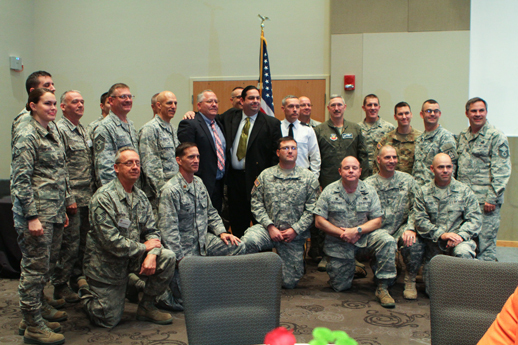 The Fort Wayne Base Council, NIDIA, and a number of current U.S. military officials and veterans of the U.S. Army, Air Force, Navy, and U.S. Marines recognized O'Brien and his company for meeting new and technical challenges faced by the United States Armed Forces, including cybersecurity, cyberwarfare, and physical security. O'Brien's company, Scorpion Computer Services, Inc., is a provider of consulting services to the U.S. military. On the eve of receiving the award and recognition, O'Brien provided the keynote speech at the NIDIA Mega Conference, a semi-annual gathering of top defense industry officials. 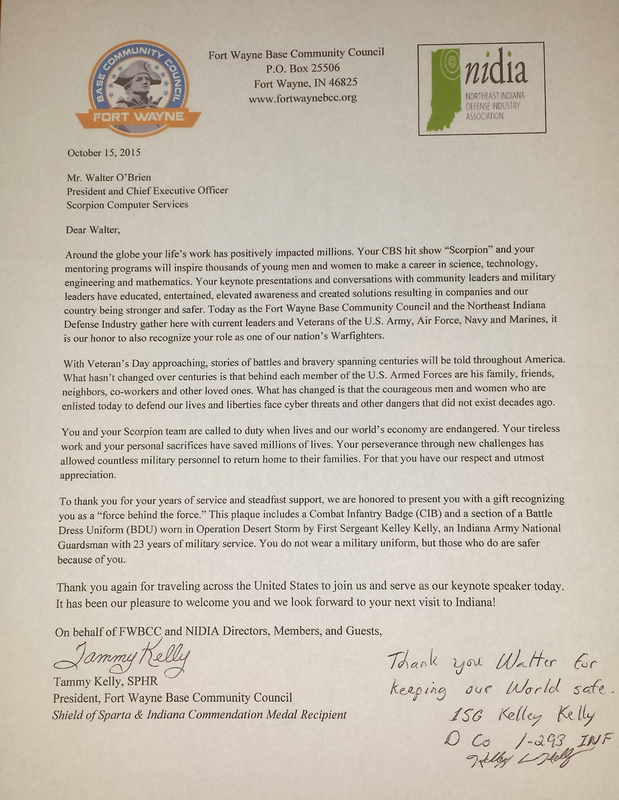 Said Fort Wayne Base Community Council President, Tammy Kelly, SPHR about O'Brien and Scorpion Computer Services: "Your perseverance through new challenges has allowed countless military personnel to return home to their families." As part of the recognition and award, O'Brien received a Combat Infantry Badge and part of a Battle Dress Uniform from Operation Desert Storm worn by First Sergeant Kelley Kelly, an Indiana National Guardsman with 23 years of service who was present. The NIDIA (Northeast Indiana Defense Industry Association) was formed to address issues and opportunities facing the 20 counties in the Northeast Indiana defense industry community. Specifically, NIDIA will: (1) take actions to work with the community educators in the region to develop and improve the local defense community's ability to develop, attract, and retain the required talent to effectively execute business opportunities, (2) foster the increased and improved interaction between the defense industry and suppliers in the region for accomplishment of better services to defense and homeland security customers. (3) perform as an advocacy group for the defense industry in the Northeast Indiana region (4) provide liaison with local, state, and federal governmental agencies, elected officials, legislatures, and special groups and committees, to advance defense industry opportunities in the Northeast Indiana region to support economic development.